Recipe from Dishing Up Vermont by Tracey Medeiros (Storey Publishing). Croque Monsieur is a fun dish that plays on the French Canadian traditions of Vermont and New England. 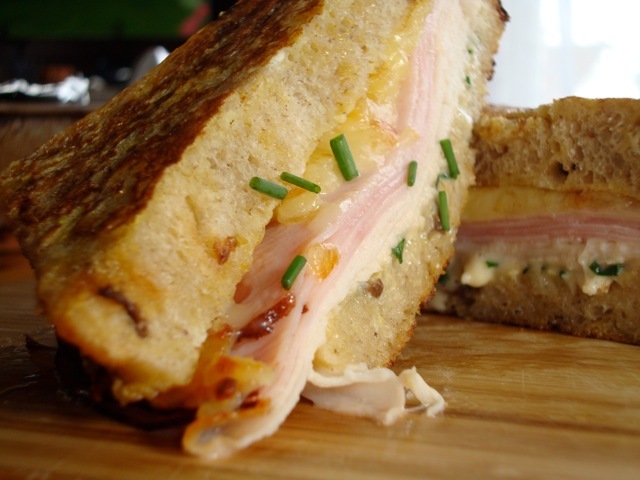 At the Cliff House, the Croque Monsieur is made with maple cinnamon raisin bread from Elmore Mountain Breads, roast turkey from Misty Knoll Farm, ham from Vermont Smoke & Cure, Gouda cheese from Taylor Farm, and mascarpone cheese from the Vermont Butter & Cheese Creamery. It makes a great brunch dish or a hearty breakfast sandwich. 1. Preheat oven to 325 degrees. Mix together maple syrup, chives, and mascarpone in a small bowl. 2. Whisk together the eggs, cinnamon, nutmeg, brown sugar, and salt and pepper to taste in a medium bowl. Dip bread into egg mixture until well soaked and shake gently to remove excess. 3. Melt a pat of butter in a large skillet over medium heat. Add the bread and cook until golden brown on each side. Remove the bread from pan and spread the mascarpone mixture over one slice. Layer turkey, ham, and Gouda over mascarpone. Top with the second slice of bread and bake in the oven until warmed through and the cheese has melted. Based on 2 servings: 498 calories, 32 grams protein, 30 grams fat, 15 grams saturated fat, 26 grams carbohydrate, 1 gram fiber, 314 milligrams cholesterol, 695 milligrams sodium. "I am pleased to introduce the newest inductee to my personal sandwich hall-of fame. Drum roll, please. The Vermont Croque Monsieur from Tracey Medeiros's Dishing Up Vermont is about as close to sandwich perfection as you can get." - from the Dishing Up Vermont cookbook review by Caroline Russock, "Cook The Book" column, Serious Eats blog.